The cell. 3. Cell membrane. Transport. Atlas of plant and animal histology. Membranes are barriers against free diffusion of ions and electrically charged molecules. However, many molecules that cells need, like ions, carbohydrates, peptides, and some lipids, must cross the cell membrane to perform their functions. For example, glucose must enter the cell to be used as energy source, and ions are needed for electrochemical gradients. Around 10 % of the genes of a cell are involved in membrane transport, pointing how important this mechanism is. As we mentioned in previous pages, concentration gradients across membranes are involved in many cell functions. Cells need to take control of these gradients, so that they can be generated, modified and removed when it is needed. A deep knowledge of the membrane transport is not only useful for knowing how cells work, but also to improve the synthesis of drugs that need to cross the cell membrane to function intracellularly. In membranes, there are proteins specialized in the transport of molecules and ions for metabolism or electro-chemical grandients purpouses.They are transmembrane proteins that are dividen in three groups: pumps, transporters (or carriers) and channels. Figure 1. Some examples of ion transport, mediated by proteins, propelled by different energy sources. These proteins are known as pumps. The first example (on the left) shows a protein complex from the respiratory chain of mitochondria. The next one is a bacteriorhodopsin that uses visible light to move protons across the membrane. 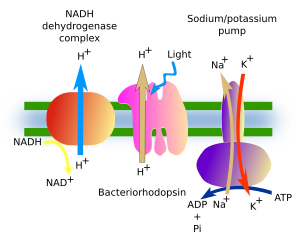 On the right, a pump is shown exchanging sodium and potassium across the membrane, and contributing to generate gradients across the plasma membrane (modified from Alberts et al., 2002). Pumps are transmembrane proteins for moving ions or small molecules against their concentration gradient from one side of the membrane to the other (Figure 1). They are also known as primary active transporters. The energy for these movements may be obtained from different sources, such as light, oxidoreduction chemical reactions, and from ATP hydrolysis, which is the most frequent source. Pumps transform chemical or electromagnetic energy in electrochemical gradients that are used by many cellular processes. There are not many different classes of pumps, and can be classified according to their source of energy. a) Light. For example, bacteriorhodopsin uses light to create a proton gradient in membranes of some prokaryotes. b) Oxidoreduction potential. Complexes of the respiratory chain of mitochondria uses oxidoreduction changes to move protons across the inner membrane. c) ATP. There are several types of pumps in this group. Some of them introduce protons in organelles, such as those present in the lysosomal membranes, a process that results in the acidification of the lysosomal lumen and facilitates the degradation of molecules by the acid hydrolases. To this group also belong both mitochondrial and chloroplast ATPases, since they use the proton gradient for synthesizing ATP, although they can also perform the opposite process (generate proton gradient by consuming ATP) in some circumstances. Another type of pumps uses ATP for transporting several ions. The sodium/potassium pump is in charge of the concentration gradients of the plasma membrane that make possible neuronal excitability, cell muscle contraction, absorption of digested molecules from the intestine, and many more processes. We can imagine how important this pump is considering that it consumes up to 25 % of the total cellular ATP of animal cells. To this family of pumps also belong those pumps responsible for the transport of cations, such as calcium. For example, one of them takes calcium out of the endoplasmic reticulum during each muscle cell contraction. Finally, there are the ABC pumps that use ATP to move a large variety of molecules across membranes. They are present in all studied eukaryotic cells so far, and are able to transport ions, carbohydrates, amino acids, and small polypeptides. Figure 2. Drawing showing the type of transport that is carried out by transporters. It can be uniport if they move molecules in only one direction. Another type is cotransport, where two types of molecules are moved across membranes, usually propelled by concentration gradient of one of them. 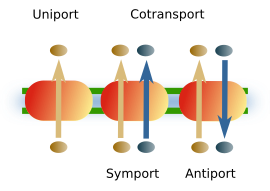 Cotransport may be symport if the two type of molecules are move in the same direction or antiport if they are moved in opposite directions (modified from Alberts et al., 2002). Transporters are transmembrane proteins that use electrochemical gradients to move molecules across membranes (Figure 2). This type of movement is known as facilitated diffusion. It is passive because the movement is propelled by the existing electrochemical gradient and it is facilitated because the transporter is the way that allows molecules to cross the membranes. Transporters are very diverse and abundant, there are more than 100 families, and can be found in all cell membranes. Before the movement across the membrane, the molecule to be transported must be first recognized by the transporter, and then a conformational change of the transporter occurs, allowing the transfer of the molecule across the membrane. The are different types of transport. Uniport transport occurs when one molecule is moved by concentration gradient, is carried out by the so-called primary transporters. Cotransport is when two types of molecules are transported at the same time. Cotransport may be antiport, when the two types of molecules travel across membrane in opposite directions, and symport, when they both are moving in the same direction. During co-transportation, one type of molecule is propelled by gradient concentration, whereas the other uses this energy to move against its own gradient concentration. For example, cardiomyocytes use the Na+/Ca2+ transporter to move Ca2+ against gradient concentration from the cytosol to the extracellular space by using the energy of the incoming movement of Na+ from the extracellular space to the cytosol by gradient concentration. During cotransport, similar elements are exchanged: cation for cation, anion for anion, sugar for sugar, and so on. However, different types of elements can be transported during symport processes. For example, in intestine epithelium, enterocytes use incoming stream of Na+ to enter D-glucose. The transporter doing cotransport are sometimes called active secondary transporters because they use the energy stored in gradients, but the ATP is actually spent in generating that gradient. Figure 3. 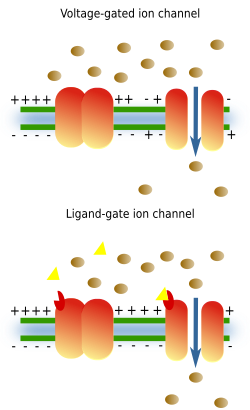 Ion channels contain hydrophilic passages that allow ions to cross membranes moved by concentration gradient. These channels can be opened and closed. For example, voltage dependent channels are opened or closed depending on the membrane potential (electric charges distribution at both sides of the membrane), but others are opened when a ligand, such as a neurotransmitter, is recognized by their extracellular domain (modified from Alberts et al., 2002). Channels are transmembrane proteins containing hydrophilic passages that communicate both sides of the membrane (Figure 3). They have the ability to open and close the passage depending on certain signals. The main function of channels is to handle the ionic gradients in order to modify the membrane electrochemical potentials, so that those changes turn into information for the cell. They are also needed for secretion and absorption of substances, as in the kidney. In any case, it is always a passive movement of ions through the channels, since ions move by gradient concentration. The selection of ions going through the channels depends of the diameter of the hydrophilic passage. There is wide variety of channels: Na+ channels, Ca2+ channels, K+ channels, Cl-, and some others. Aquaporin is a different type of channel that allows water to cross the outer mitochondrial membrane without restrictions. Furthermore, there are voltage dependent channels, mechanosensory channels, ligand dependent channels, termorreceptor channels, etcetera, depending on what stimuli regulate the channel behavior. If this regulation is produced by changes in the value of the electrochemical membrane potential, channels are known as voltage gated channels. They may be also ruled by ligands (ligand-gated channels) or by chemical modifications, such as phosphorylation. Channels carry out essential functions for organisms such as neuronal excitability, polyspermy prevention (avoiding more than one sperm fusing with the oocyte during fertilization), etcetera. Channels and transporters behave differently. Channels open a passage, which is a way for ions to move freely in both directions. However, transporters do not allow free moving of the transported molecules, which need to be handled by the transported. That is why the molecules are transported in just one direction, sometimes against their concentration gradients by using the energy of concentration gradients of other molecules.